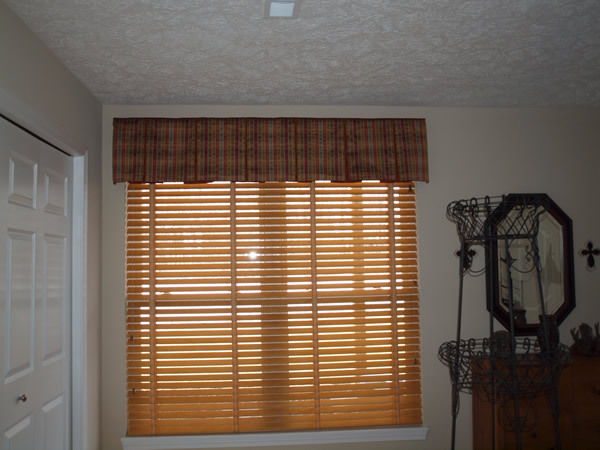 Elegant Window Treatment Using Wooden Blinds from Kathy Ireland - Sew What? Sew Anything! My client had just moved into a condo after downsizing. He wanted to match the bedding. We created a boxed pleated valance in a great plaid that had a coordinating fabric in the box that just peaks out a little bit. To give the room privacy a great Kathy Ireland two inch wooden blind with tape on the shades blocks the western sun and helps cover the window.